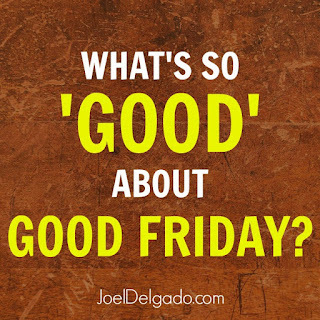 JOEL DELGADO: What's So 'Good' About Good Friday? 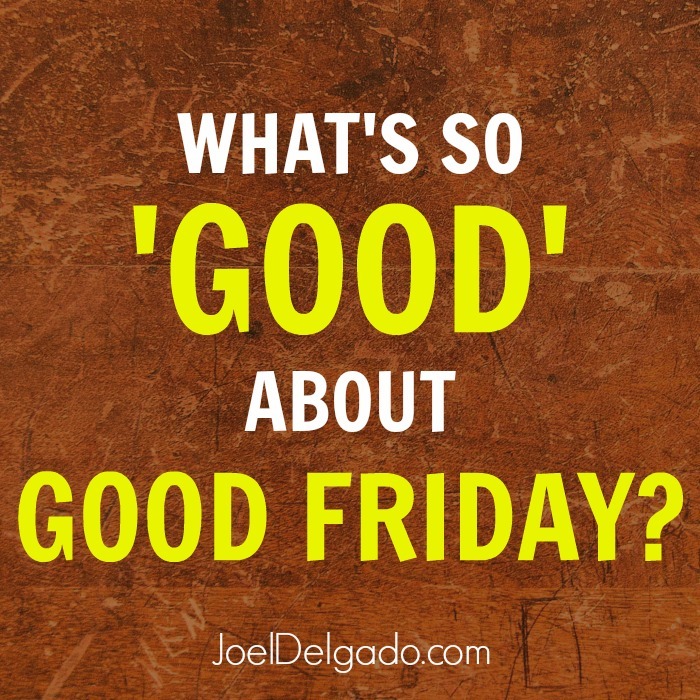 I used to wonder sometimes why we called Good Friday, well, “good.” I mean, on the surface, it just didn’t seem very “good” at all. In the span of about 24 hours, Jesus was betrayed by one of His own disciples and deserted by the rest before being sentenced to death and crucified. At the time, things weren’t looking very good at all. I’m pretty sure the disciples weren’t thinking there was anything good about this. I can imagine they were filled with fears and doubts, sadness and shame. Not exactly what I would call a banner day. Jesus wasn’t the only person being crucified that day. There were two other criminals who were led away to be executed with Him, one on His right and the other to His left. They both probably witnessed a lot of these events unfold throughout the day: from the crowd's call for Jesus’ death and Pilate’s failed attempts to release Him to Jesus being beaten and mocked mercilessly on the way to the cross. But they both responded to Jesus differently. It appears that he was looking for a “Get Out Of Jail Free” card; a bailout from this pain and the situation. There’s no sign of remorse for his own actions. He sees Jesus potentially as some sort of genie who can wiggle him out of this jam and didn't seem to see his own need for grace. His heart was hardened, right to the end. Before moving forward, there’s a truth here I don’t want us to miss: We are the criminals in this story. I struggle with this truth sometimes, to be honest. I think a lot of us do. We like to compare ourselves to other people and think we’re doing pretty well for ourselves. We’re pretty good at convincing ourselves that we’re pretty awesome. But we are all in the same predicament. We are all broken people who have fallen short and made mistakes. We are all sinners who have missed the mark. We are all facing a death sentence. And we are all in need of a Savior. Before all of this went down, Jesus asked “Father, if You are willing, take this cup away from Me — nevertheless, not My will, but Yours, be done.” He was anguishing over this decision to face not only death, but the excruciating pain that came with it. But if He hadn’t gone through it, those two criminals never would have never met Jesus or had the opportunity to have their lives changed. They would not have been able to see who Jesus was. Criminal #2 didn’t do anything to deserve grace. And that’s the whole point -- we can’t earn our way to grace. We can’t earn God’s mercy. It’s a gift, the only gift that can save us all. Good Friday is good because we see God’s goodness, grace and mercy in full display. Jesus endured the pain, the humiliation and the cross on that day because of His love for those criminals, and for us. Good Friday proves that no one is too far for God to reach, no matter who they are, where they are or what they have done. And Jesus’ death isn’t the end of the story. Three days later, He rose from the dead to prove once and for all that He really does have the power to bring us from death and into life, as well. To restore what was lost. To forgive us and give us a new life to live. There wouldn’t be an Easter Sunday without Good Friday. The Gospel, which means good news, wouldn’t be the Gospel if Good Friday didn’t happen. That’s what makes Good Friday so good.